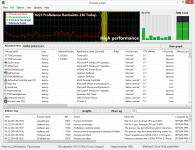 Process Lasso x64 is NOT yet another task manager. It is a process priority optimization and system automation utility. Priority optimization, affinity optimization, core optimization, automated rules, automated power schemes, you name it and Process Lasso x64 has it. Although most consider Lasso the ultimate process priority optimizer, it does so much more! Process Lasso x64 is NOT yet another task manager. It is a process priority optimization and system automation utility. Priority optimization, affinity optimization, core optimization, automated rules, automated power schemes, you name it and Process Lasso x64 has it. Although most consider Lasso the ultimate process priority optimizer, it does so much more! The list of active processes shows the name, user name, application name, ID, assigned rules, priority class, CPU affinity, I/O and memory priority, CPU level and average level (in percentage), CPU time, restraint history, memory (private bytes and working set), number of threads allocated, handles, page faults, and other relevant information. 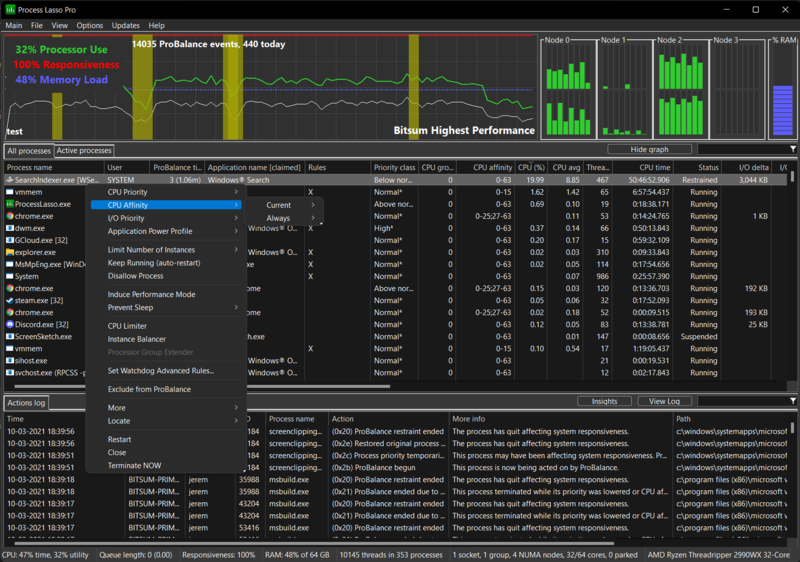 Don't just take our word on ProBalance, try our graphical CPU Eater to see the benefit for your own PC. This is a simple 'CPU Eater' running at normal priority, something any programmer can easily recreate in any language. How many threads running at normal priority, doing nothing other than consuming CPU cycles, do you think it would take to bring your PC to its knees? On a single core system it takes merely one thread at normal priority! Yes, it would almost seem like a bug in Windows, but it is by design, an explanation we also give in the above link. All Process Lasso Server x64 reviews, submitted ratings and written comments become the sole property of Windows 7 download. You acknowledge that you, not windows7download, are responsible for the contents of your submission. However, windows7download reserves the right to remove or refuse to post any submission for any reason. Windows 7 Download periodically updates pricing and software information of Process Lasso Server x64 full version from the publisher, but some information may be out-of-date. You should confirm all information. Using warez version, crack, warez passwords, patches, serial numbers, registration codes, key generator, pirate key, keymaker or keygen for Process Lasso Server x64 license key is illegal and prevent future development of Process Lasso Server x64. Download links are directly from our mirrors or publisher's website, Process Lasso Server x64 torrent or shared files from free file sharing and free upload services, including Rapidshare, MegaUpload, YouSendIt, SendSpace, DepositFiles, DivShare, HellShare, HotFile, FileServe or MediaFire, are not used.